Creative Bride and Groom Seating Signs. After you’ve been married, what better way to show off your new status than by adding seating signs at the sweetheart table? There are so many fabulous ways to display your seats, whether you want to have bride and groom chair decor or go with a fun mr. and mrs. seating sign. There are endless designs and styles to use in your wedding so it matches perfectly with the surrounding decor. Something simple, such as hanging handwritten signs to the two chairs, looks elegant -- yet effortless. If you want a minimal design in the reception, this works perfectly. Use chalkboards or other textures to create unique signs get as creative as you want, such as surrounding the edges of a chalkboard with moss, fabric or other crafty addition to create a vintage look. For elegant seating options, ornate displays look stunning and donÂ’t detract from the rest of the table setting. 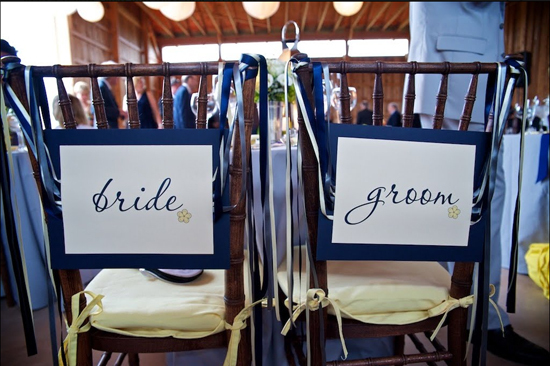 Highlight the bride and groom chairs by complementing seating signs with beautiful flowers or other decor colored ribbon and flowers will look stunning with the other reception colors or textures! Another way to display the special seating is to simply use the name of the bride and groom these fun, colored seat signs look amazing with the typography and shape for something a little more original.